Update! 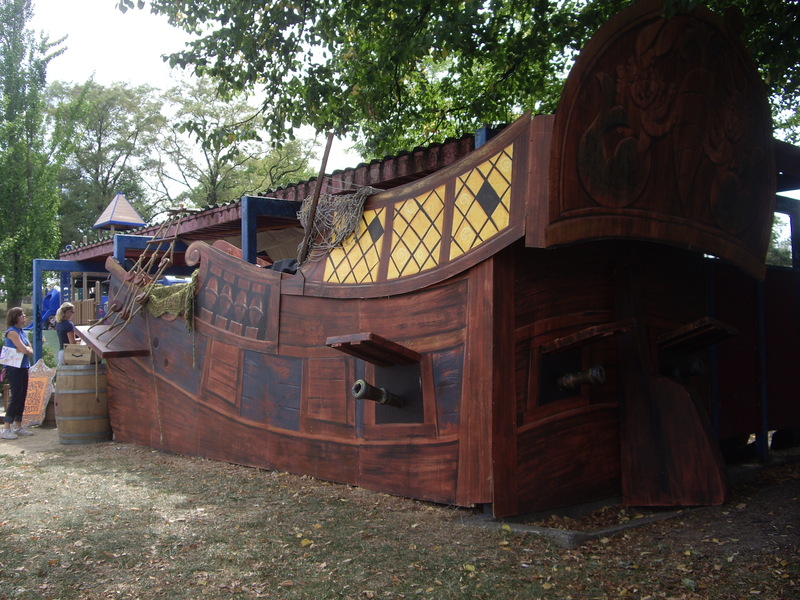 If you live in Chicago, me shipmate Carolyn Crimi will be at Magic Tree Bookstore in Oak Park, 1:00 for a Talk Like A Pirate Day book signing! You can walk the plank and get a free tattoo! Henry & the Crazed Chicken Pirates is available in paperback—just in time for Talk Like A Pirate Day tomorrow! 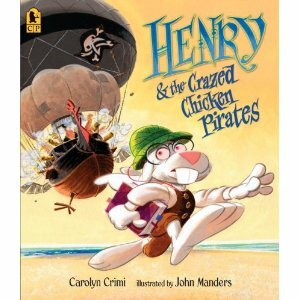 While you’re at it, Henry and the Buccaneer Bunnies and Henry & the Crazed Chicken Pirates are both available in audio format. 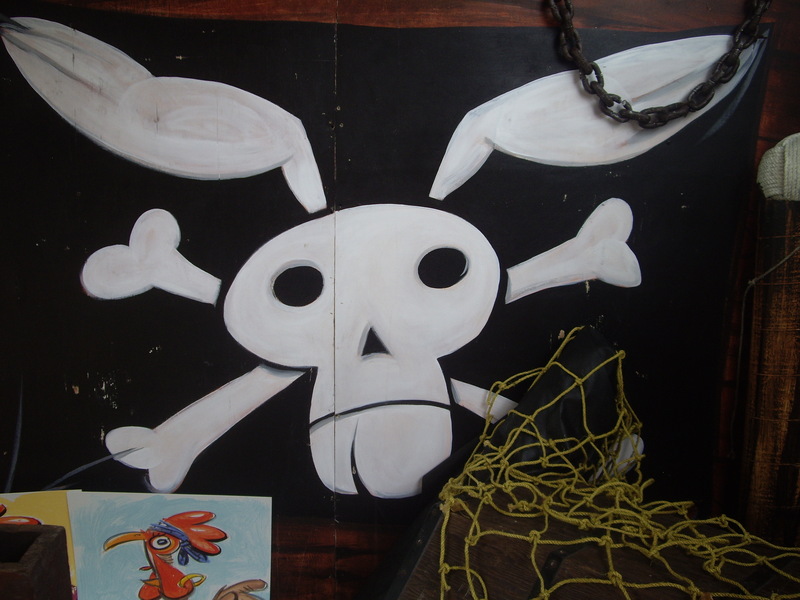 Point your bowsprit over here for buccaneer bunny coloring pages, lyrics to Nibble Yer Greens (a beloved old buccaneer bunny sea shanty), and a handy glossary of piratical words to carry around with you tomorrow. Three miles—roughly the distance a person can walk in an hour. From Ushant to Scilly ’tis thirty-five leagues. The islands of Ushant & Scilly mark either side of the English Channel if you enter it from the Atlantic Ocean. Ushant is near France, Scilly near Great Britain. Remember—September 19th is Talk Like A Pirate Day! A pirate. The earliest pirates of the Caribbean were newly-arrived French woodsmen who preserved meat by curing it slowly over a smoky fire so it would last a long time (this was before refrigerators). In the native Carib dialect, boucan was a grill (in Haitian: barbacoa). The French settlers named the process of smoking and curing meat boucaner and called themselves meat-curers—boucaniers. When Spain drove out the French settlers in the 1690s they turned to piracy. They continued to call themselves boucaniers and there may have been a grim joke in the name—the native Caribs were rumored to be cannibals. Maybe the boucaniers hoped their enemies would associate them with their grisly former neighbors. Rum diluted with water. On long voyages, sailors might contract scurvy, a disease caused by a lack of Vitamin C. Ship’s doctors eventually realized there is lots of Vitamin C in lemons, so they’d make sure everybody drank their lemon juice by adding it to the grog. Blackbeard Teach liked his with a little gunpowder mixed in. September 19th is Talk Like A Pirate Day! The black pirate flag with skull & crossed bones. The earliest pirates—French filibustiers—simply hoisted a red flag to announce their piratical intentions. It’s not hard to imagine one of the crew darkly describing the flag as “un joli rouge”—a pretty red. Mark your calendar—September 19th is Talk Like A Pirate Day! Update: My friend Melanie pointed out that ‘drapeau‘ (flag) is masculine, so I should have spelt ‘joli’, not ‘jolie’. Since corrected! Alphabet Trail and Tales in Pittsburgh’s Frick Park was a blast yesterday—the Salty Carrot was dragged out of drydock and assembled at the big Blue Slide pavilion. We had glorious weather, too. We read Henry & the Crazed Chicken Pirates (now in paperback! 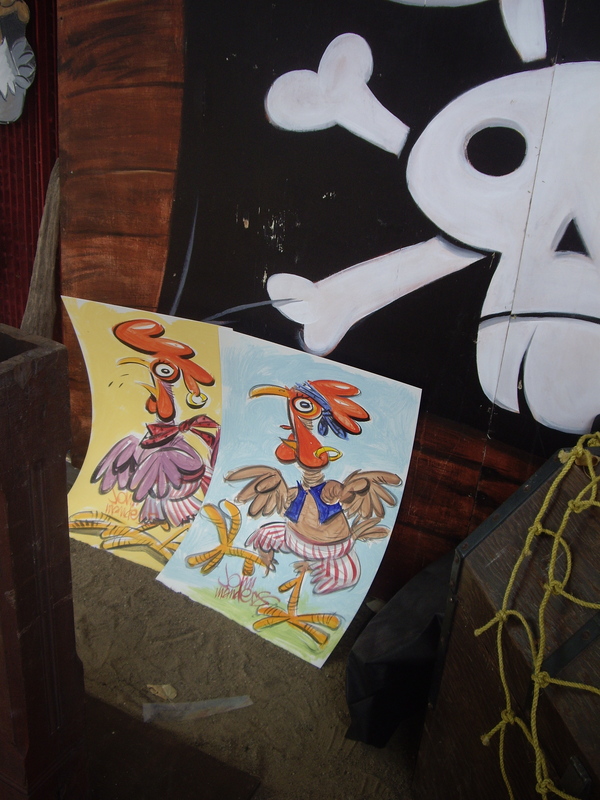 ), then painted a few crazed chicken pirates. Thanks to Le and Nancy for inviting me back. Thanks to the fans and friends who came out to say hello. 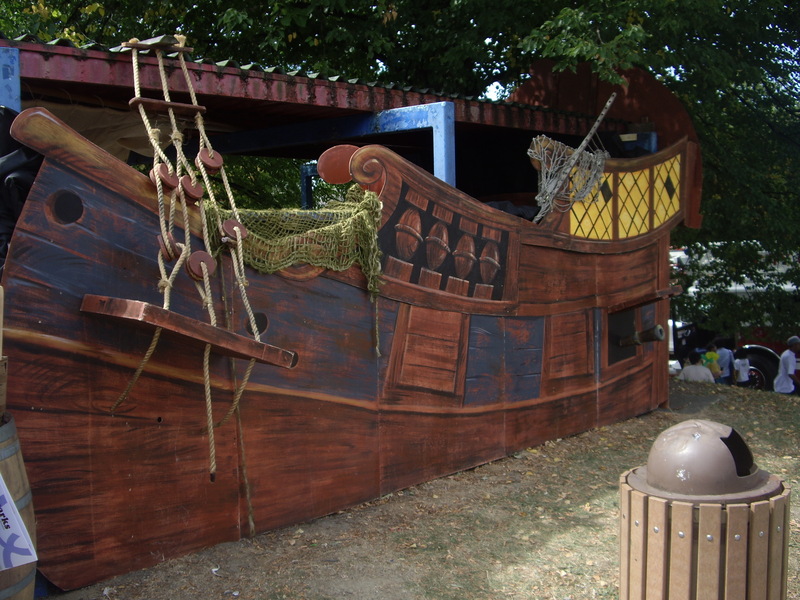 Bravo to the volunteers who created all that nautical splendor out of plywood and paint. Does anyone have a photo of the hot air balloon? Mine came out all blurry. This evening is the grand opening of Graffiti Gallery—that’s in the beautiful Transit Building, Oil City, where I have a studio—from 6:00 – 9:00. Come join us! 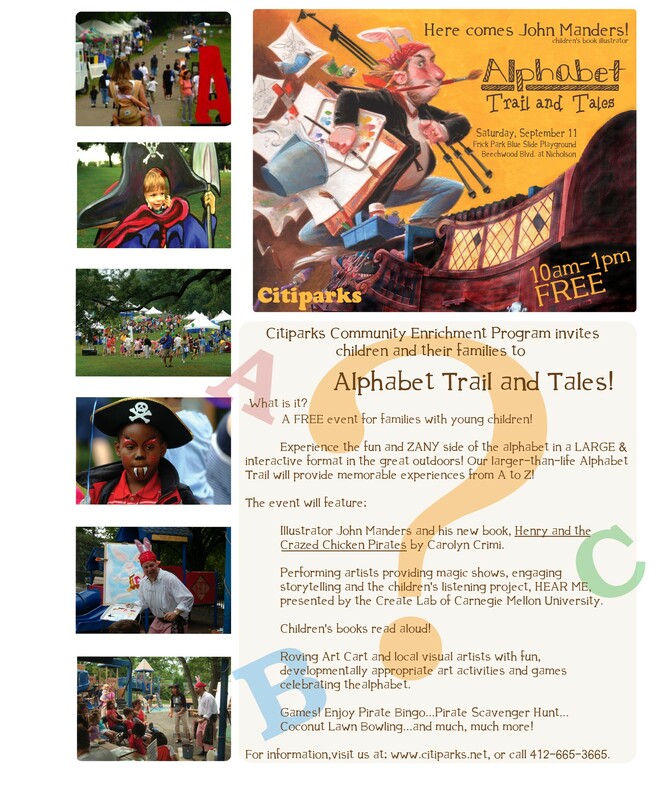 Tomorrow morning I’ll be performing at Alphabet Trail & Tales in Frick Park, Pittsburgh, from 10:00 am – 1:00 pm. I’ll read Henry & the Crazed Chicken Pirates and paint a picture—maybe we’ll sing a buccaneer bunny sea-shanty. I hope to see you there! 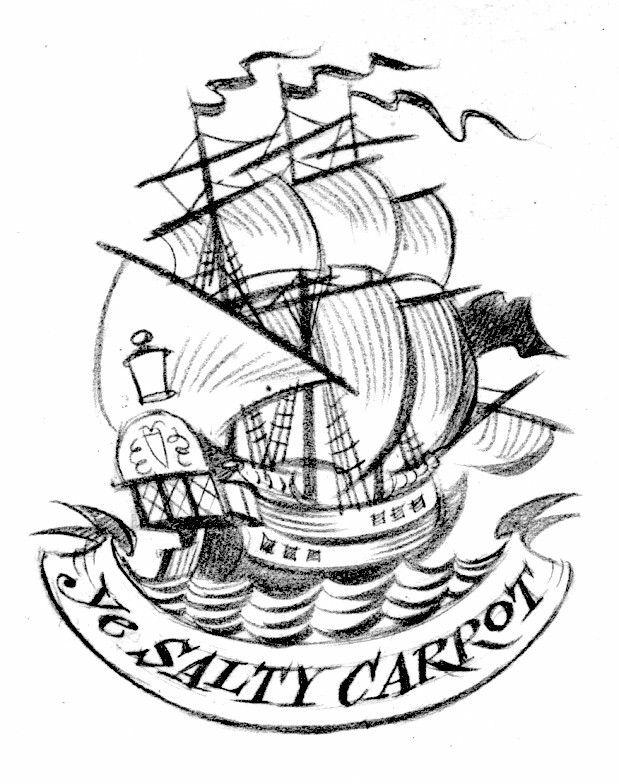 Come and join me aboard the dread Salty Carrot! 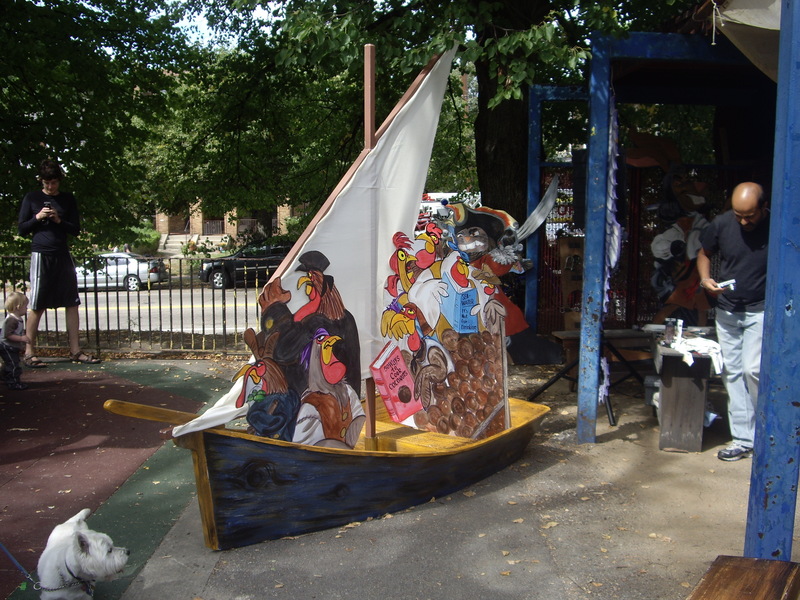 I’ll be at Alphabet Trail & Tales Saturday morning, September 11th in Frick Park—that’s in Pittsburgh, Pa. I’ll be reading Henry & the Crazed Chicken Pirates and painting and leading sea-shanty singalongs. Here’s me with KDKA-TV’s Dennis Bowman and Citipark’s Le Frankowski and Nancy Burns.